Hobbies: endurance horseback riding, reading, hiking, traveling, and pretty much any outdoor activity I can try out in my free time. How you got involved with us: Started as a student worker my freshman spring semester. The program also influenced my decision to attend Maryville College. Most meaningful thing about Mtn Challenge: I loved the flexible and fun environment, the chance to work with a diverse group of clients, and I had some of the greatest coworkers a person could ever ask for. I gained a lot of lifelong friends from my experience there (as well as some sweet skills). How it influenced you career: I look for jobs based on how they respect my free time. At my current job, there is no expectation that I be available 24/7 on weekends or vacations, so when I leave the office, I actually get to leave the office, unlike a lot of people in today’s working world. If I had to choose between two jobs, where one was more relaxed and fun but paid less, I’d take the pay cut – it’s worth it! Also, I like knowing that the place I work at does good things, and doesn’t just seek a profit for it’s own sake, gives me more satisfaction with my work. I think that started at Mountain Challenge, so now I seek work where – even if it’s not my dream job – I can at least be proud to say that I work there and know that my work helps further a worthy goal. A funny story: Mountain Challenge staffers get really close on backpacking trips together. As in, removing-ticks-from-each-others-butts close. I somehow attracted a record number of ticks on my body during the staff trip after my sophomore year, but fortunately I had fellow staffers willing to help me remove them – even if it meant getting partially mooned in the process. Another funny experience I had occurred when I was actually a participant in a Mountain Challenge course. I was also a member of the equestrian team, and we did a teambuilding activity with Mountain Challenge at the start of every school year. The two staffers leading our activities asked us to do something that seemed nearly impossible – fit the entire team on a tiny square platform. After many, many, many failed (yet highly creative) attempts, the two staff (who shall remain nameless *cough* Nick and Katie *cough*) admitted that they weren’t really sure if it was physically possible for us to successfully complete the challenge. Instead, they required us to Bernie (a ridiculous dance move) on to our next challenge. Whatever else you like: I guess you could say that Mountain Challenge will always be a big part of my life, since I got engaged at the top of the tower! 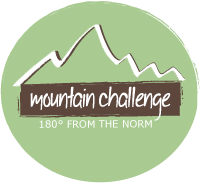 My husband and I had been friends for a couple years at Maryville College, but it wasn’t until he joined me in working at Mountain Challenge that we got to see a different side of each other in new environment – a side that we both obviously liked! So it was very fitting that he proposed 60 feet up in the air with former staff belaying us down below.